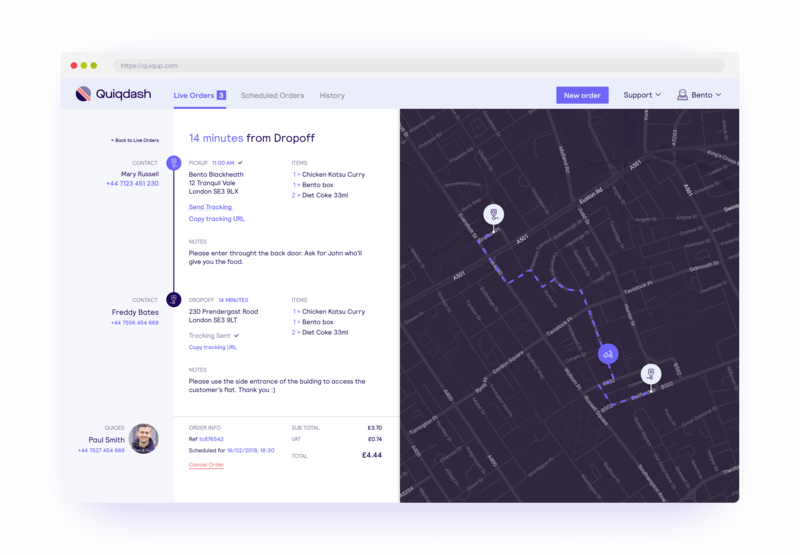 The Quiqup dashboard lets you book couriers and manage your deliveries with ease. Book a delivery for right now or shcedule a pick-up time or a dropo-off delivery window. Group orders into a single delivery run with multiple pick-up or drop-off locations. We automatically assign the fastest and most efficient vehicle for the size of your order. If your order has multiple pick-up or drop-off points, we’ll automatically optimise the route too. Create multiple orders at once by uploading a bulk file to your dashboard. Your orders are automatically created and ready to review in the Scheduled Orders page. Whether you want to deliver food in your own branded bags or are looking to get some documents signed, you can request a return with your order and our courier will take it there and bring it back to you. Tracking the progress of live deliveries is easy on your dashboard. 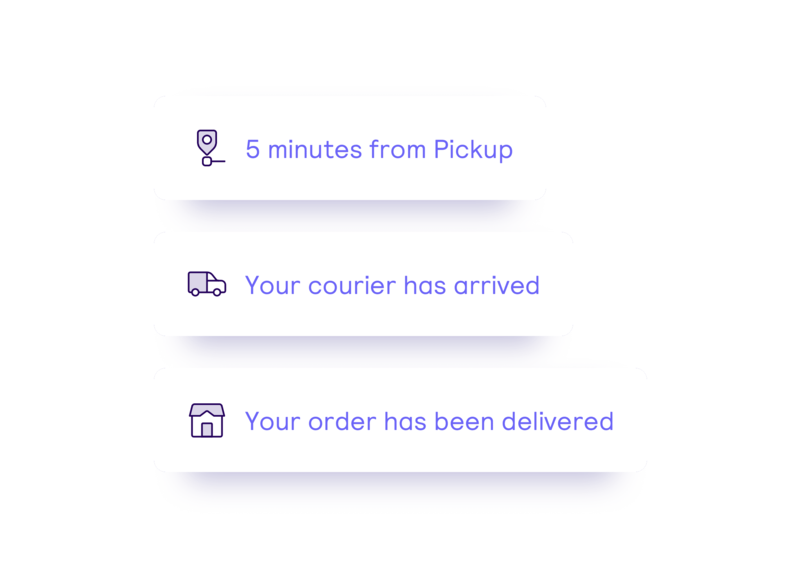 Real time ETAs will let you know when the courier is due to pick-up and deliver the parcel, and you’ll receive a handy notification when the courier is ready to pick up your order. You can also follow their journey on the map if you ever wonder where your parcel is. 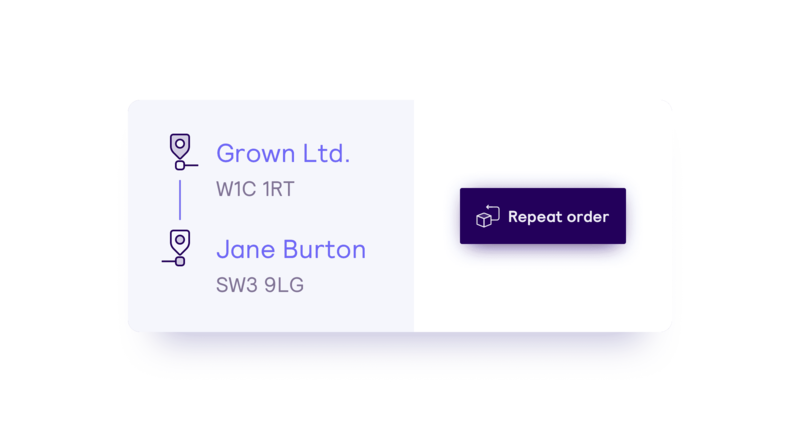 Your dashboard has a comprehensive order history page, allowing you to filter and search through past deliveries. You can also repeat past orders with the click of a button without having to create them from scratch. Send an SMS to your customer with a link to track the progress of their delivery. They’ll know when to expect their package down to the last minute. With your dashboard you have visibility of your courier’s contact details, as well as your customer’s, so if anything happens, they’re only one phone call away. Our customer service team can help you and your customer at any stage of the delivery. Either by email, live chat or phone, we’ll never leave you hanging.